The Havalon concept of quick-fix stainless steel cutting edges and dependable knife action works well in this mid-sized fillet knife. Since fillet knives need to flex during the cut, the thin steel contributes to filleting action, but you may find this knife a fascinating compromise instead of a perfect solution. The keyed shank doesn't flex and takes up almost the half the blade length, so you're really only working with about 2-1/2 inches of flexible blade. 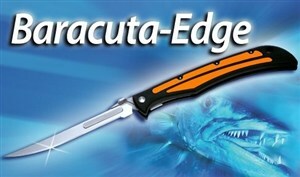 Probably you won't mind, because the convenience of this knife makes up for that minor problem. An overall length of 11 inches includes a generous six inches of Zytel handle with rubber inserts for comfortable work and a secure hold. The lockback knife opens with one-hand, using a steel tab on the base of the blade shank. The blade locks open with a strong frame lock mechanism. Cleaning is always an issue with folding hunting and fishing knives, but the Baracuta-Edge design leaves the back of the handle open for better access to the blade liners. A long stainless steel pocket clip substitutes for a sheath. The purchase includes five replacement blades of razor-sharp surgical steel. Each blade comes in a protective pouch that prevents damage to the edge in storage but won't prevent painless accidents if you decide to carry spares in a pants pocket. For a good fillet knife in a more flexible traditional pattern, see the Queen Cutlery Fillet Knife.